I’m welcoming some new watercolor painters to the medium, so there have been some requests for information about caring for watercolor brushes. 1. Rinse sizing out of new brushes. New brushes are often shipped with a watersoluble “glue” holding the bristles together to prevent damage in shipping (even brushes shipped with a plastic cover over the bristles may have sizing in the brush). The bristles will feel hard and crusty, or maybe even be stuck together completely. If you simply break the bristles free from the sizing while the brush is dry, there will be a residue of sizing in the brush, and it won’t perform well and will dry hard again. At least until you’ve painted with it long enough to gradually rinse the sizing out. Instead, rinse a new brush under warm running water and use your fingers to soften the sizing and work it out of the bristles. It usually takes 30 seconds to a minute to really rinse all the sizing out. You only have to do this once when you first buy the brush. 2. Wet the brushes you plan to use and let them absorb a little water before you start painting. Natural hair brushes, especially, need a few moments to absorb water before they will behave predictably. As synthetics have gotten better (closer to the behavior of natural hair) this has become true for them, too. When you set up to paint, dip the brush you are going to use in clear water, blot off the excess, and leave it resting on your table (preferably tip down). In addition to allowing the brush hairs a moment to absorb water, this also allows some water to move by capillary action up into the ferrule. If there is some old paint that didn’t get rinsed out entirely, this will give it a little time to dissolve and be rinsed out before it has a chance to unexpectedly sneak into your first wash. Plus, having some water already in the ferrule will dilute any paint that does migrate up that far. 3. Rinse one more time before beginning to paint. If there was any paint that didn’t get completely washed out after the last painting session, this will give it a chance to get rinsed out now, before it can contaminate your first wash. This is especially handy if you use powerful colors like the phthalo blues and greens, or strong quinacridone reds, violets and oranges. A small amount of these strong colors left in the ferrule can sneak down into your first few brushstrokes. Pretty aggravating if you meant to put down a pure, pale yellow! 4. Don’t leave brushes soaking in your rinse water. Please don’t do this to your brushes! When working in acrylics, it’s common to leave the brush soaking in rinse water to prevent the paint from drying in the brush. You may also have been taught to do this with watercolor or tempera paint as a child as a way to prevent you from laying a paint-filled brush on the table. Brushes with fairly stiff bristles and plastic handles can tolerate this, but a soft watercolor brush with a lacquered wooden handle will be quickly ruined this way. The water is absorbed into the wood of the handle, which swells, cracks the lacquered finish and loosens the ferrule (the metal collar that holds the bristles) from the handle. 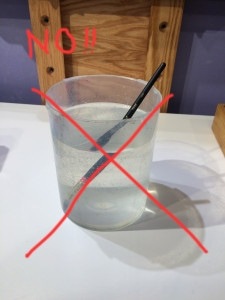 Even if you only rest the brush tip in water, capillary action and time will draw water up into the ferrule where it can then be absorbed into the wood of the handle. In some cases, the glue holding the handle to the ferrule will also be damaged and the handle will fall off. In some brushes, the brush hairs are glued in place and the brush may begin shedding hairs if left soaking in water. Instead, keep a sponge or towel handy to blot the brush dry and lay it down flat or tip down until you need it again. A brush rest or chopstick rest makes a handy place to rest a brush, but a pair of towels works just fine, too. If you already have this habit built in from painting in acrylics, one trick is to use a small, light container for rinse water for a while. It’s a bit of a nuisance, because you’ll have to change rinse water more often, but if the container feels likely to tip over from the weight of the brush, it will help remind you not to leave the brush soaking. 5. Rinse thoroughly with clear water and leave them to dry tip down when you are done for the day. Lay your brushes on a towel on a slanted board until they are dry. It will not harm your brush if some residual watercolor dries in the brush or ferrule. Even if it sits there for twenty years, watercolor can be re-dissolved again in water. But sometimes a bit of color is drawn up into the ferrule by capillary action. If the brush is left to dry tip down, most of this color will move down out of the ferrule, making it easier to rinse out before you begin your next painting session. I take an extra painting support, prop up one end with a rolled up towel, drape another small towel over the support and lay my brushes on it, tip down, to dry. 6. Don’t put wet brushes in a jar for storage. It looks pretty, and it keeps your brushes handy, so many people store their brushes, tip up, in a jar. So do I (well, my acrylic brushes, anyway). But not until they are thoroughly dry! Letting them stand tip up in the jar to dry just encourages water to run down into the ferrule where it has little chance to evaporate. This invites the same problems as leaving your brushes soaking in your rinse water. I have several watercolor brushes with cracked lacquer and loose ferrules because I put them back in jars before they were really dry. 7. Unroll or open up brush carriers as soon as you get home. 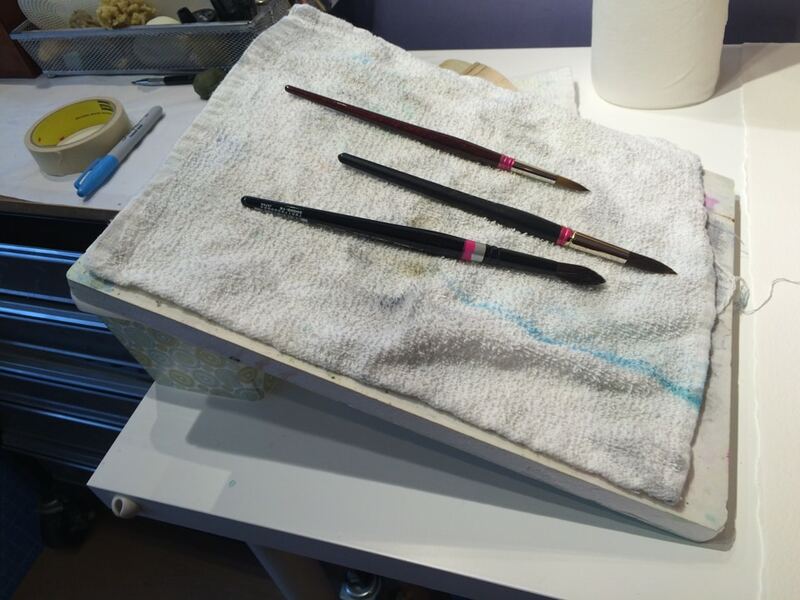 If you transport your brushes to a class or a plein air session in a brush carrier, be sure to unroll or open it as soon as you get home to allow moisture to evaporate. It’s better if you can take your brushes out and let them dry completely before re-packing, but this may not be practical in a multi-day workshop or while traveling. But do at least take the time to open up your brush carrier and let your brushes dry out. In addition to the problems of handles cracking or ferrules loosening, leaving brushes stored in a closed carrier can lead to mold. Many watercolor paints contain ingredients like honey or glycerin to help them stay moist. Although a jar of honey is unlikely to grow mold because of its low water content, molds think the (quite diluted) honey in your paint is yummy! Once you get mold contamination in your brushes or paints, it can be very difficult to eradicate, so it’s best not to give it a chance to get started. 8. Don’t panic if a brush gets smushed and dries in a wonky shape. I hear that some of you leap out of bed in the morning looking beautifully put-together, but my hair is prone to bed-head. Luckily, a shower fixes that. Sometimes a brush slips to the bottom of your tote bag and gets a case of “bed-head”, too. It can be a bit worse than my hair in the morning, because the brush may have been there for days or weeks before being discovered. Even so, you can reshape the brush using warm water. If it’s been hiding in the bottom of your tote bag for some time, you may have to massage it under warm water for a few minutes before it starts to cooperate. If that’s not enough to do the trick, blot the brush to remove excess water and use hair gel to reshape the bristles and hold them in place. After the brush dries, rinse out the hair gel as you would sizing from a new brush and all should be well. On rare occasions, I’ve had to repeat the process a few times to completely reshape the brush. 9. Don’t try to make a brush come to a better point by trimming it. Occasionally, you will find a brush hair or two sticking straight out to the side, and the warm-water trick doesn’t fix it. In this case, the brush hair may actually be partially broken, and the best solution is to trim that one hair (or two) off at the ferrule. But don’t try to reshape an entire brush by trimming it. It simply doesn’t work. The reason a brush comes to a point is that there are longer hairs in the middle AND that each hair (even synthetic ones) has a natural taper to it. Trimming the brush removes the natural taper and makes it LESS likely that you’ll get a good point. Sadly, there’s no fixing this. The best way to avoid that problem is to buy your brushes (at least the expensive ones) at an art supply store that will let you try the brush in clear water before buying. Even a high-quality brush can be damaged in shipping or by other customers handling it in the store, so this is especially helpful if the brush does not have any sizing or protective cover. It might still be a perfectly good brush, but trying it out will ensure it hasn’t been damaged. 2. 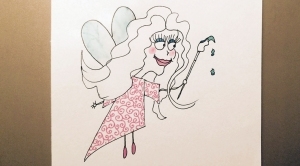 The longest hairs at the tip of the brush have been broken or split. Depending on your style, a good natural-hair or quality brush may last a few months or a lifetime. You have to be pretty rough with it to break a brush down in a few months, but aggressively stabbing at the paper, scrubbing and dry-brushing can be hard on a brush. My solution to this is to use one of the wonderful synthetics or synthetic-natural hair blend brushes on the market today, paint with abandon, and buy a new brush after 2 or 3 years. A size 14 Winsor & Newton series 7 Kolinsky sable brush (long considered the “gold standard” of watercolor brushes) has a list price of $499 as of today! (Although nothing sells for “list price” so you can probably find one on sale for “only” $300-350.) The list price for a size 14 is $1299!!! Yikes! I don’t know who actually buys these brushes, because you can buy an equally good (actually, I think they are better), Escoda kolinsky size 10 for around $50 – $80 ($120 for a size 14). This was my workhorse brush until about 5 years ago. But in the last few years, synthetic brushes have gotten so good that I much prefer to buy a far-less-expensive synthetic and not have to worry if I’m treating it gently enough. Not only are they cheaper, but synthetic brushes generally stand up very well to rougher painting techniques. My workhorse brush now is an Escoda Prado or a Silver Black Velvet. I can buy a size 12-16 for under $25 and it will last several years before it no longer comes to a sharp point. Considering that I paint a lot, and use this brush for most of my painting, that’s not bad. When I buy a new one, I still use the old one (there are times when you don’t really want a sharp point). 3. Something has dried in the ferrule. This is much more of a problem with acrylic than watercolor, but even with watercolor, dried paint or binder (gum arabic) in the base of the ferrule prevents the brush hairs from lying as close to one another as they should, so the tip can’t quite come together in a sharp point. If a brush seems to want to separate into two points, dried gunk in the ferrule is almost always the culprit. If it’s watercolor causing the problem, plain water will remove it, but it can take a surprisingly long time to dissolve material that is dried inside the ferrule. The rinse water has to make its way up there by capillary action and then back out again. You can speed the process by grasping the brush handle in one hand and the brush hairs in the other close to the ferrule, and firmly wiggling the whole mass of brush hairs back and forth near the ferrule. If you use a little shampoo or soap, you’ll often be able to see the color coming out of the ferrule in the soap foam, which can help you make sure you are really getting all the dried paint out. If the dried material is acrylic paint or glue, you can often remove it by working a citrus based cleaner (such as CitraSolv or GooGone) into the brush hairs near the ferrule, and wiggling to help the cleaner move inside the ferrule. Let it sit overnight and then wash using shampoo or castile soap. You may have to repeat this several times to remove dried acrylic paint or glue. Citrus cleaners sometimes also work for dried masking fluid, but not always, so . . .
10. Never use your good brushes for applying masking fluid! Masking fluid dries fast! You can ruin a brush in the length of time it takes to mask an small area, as the masking fluid will often dry in the brush near the ferrule while still flowing at the tip. Don’t risk it! You do want to apply masking fluid with a decent brush, but stick with a good-quality inexpensive synthetic. Princeton Brush has a line of white- and gold-taklon (nylon) brushes call Snap! that are surprising well-behaved brushes and not expensive. There are several other lines of white- and gold-taklon (nylon) brushes that are similar. You should be able to find a decent brush for masking for under $5. 11. Before using ANY brush for masking, wet it with soap solution. I simply dip my masking brush in water and scrub it around on a bar of Ivory soap. I’m especially careful to get some soap worked into the area near the ferrule, to keep masking fluid OUT! I use plain old Ivory soap because it doesn’t have moisturizers or oils that might affect the flow of water-based media. Some people use a solution of soap and water, but for me, a bar of soap is quicker and easier. 12. Love them and USE them often! Okay, your brushes might not last longer if you use them often, but they are definitely happier—and so are you! A busy brush is a happy brush!